Any citizen of Lowndes County or any person wherever residing may be heard by the Lowndes County Board of Commissioners during the aforesaid public hearing. That means anyone from anywhere may speak. My name is April Huntley, and I have lived in Naylor for over 13 years. I have used the boat ramp at the end of Old State Rd. that gives access to the Alapaha River for most of those years. Until yesterday, when I spoke to Phillip Connell, I didn't know I was trespassing when I swam in the river. I thought this was public access. I thought this belonged to Lowndes County. I thought about this some more and questions rose up in my mind. Why hadn't the game wardens and sheriff deputies that came to check the area at times notified me and others we were trespassing? Why would Lowndes County not claim their ONLY boat ramp to the Alapaha River for the benefit of their residents? that despite what the tax assessor has on their website and in their records, their attorney viewed the deeds showing Phillip Connell bought the property from Dr. Acree 2 or 3 years ago. His lawyer (I'm assuming Mr. Connell's) filed something wrong and that's why it isn't showing up with the tax assessor. The story when I spoke to Bill Slaughter, Commission Chairman, Friday afternoon was that we need to prove ownership because he and Commissioner Evans had walked the property with Phillip Connell. Mr. Connell says he owns both sides of the road. So from Friday afternoon to Monday morning deeds have been found to prove ownership of the land? And these deeds contradict tax records? So is it 2 or 3 years? Doesn't a deed have an exact date on it? Who has been paying the taxes for the last 2 or 3 years? Wouldn't somebody notice if they were paying taxes on land they didn't own for 2 or 3 years? In light of these new discoveries, the people immediately request information on what exactly the lawyer filed wrong which caused Phillip Connell's supposed property along Old State Rd. not to show up in the tax assessor's records, the exact date Mr. Connell purchased the property from Dr. Acree which gives him ownership of the land on both sides of Old State Rd. and the deeds. Most importantly the people request to know when and why Lowndes County lost the boat ramp to private property. Oh, one more question, did the state of Georgia build the boat ramp with prison labor? Commissioners, I respectfully request this information and that you deny the proposed abandonment of .17 miles of County Road 16, Old State Rd., leading to the Alapaha River. Thank you for your message of 1 February. Yes, the binders of the documents for the closings of the various bonds are the sort of financial instruments I requested in my message of 28 January, and that Chairman Slaughter listed in his letter dated 18 January (that I received 28 January). Monday 11 Feb 2013 after the Work Session will be a good time for me to inspect and copy those binders. I will bring a camera and a photocopier. If that time will not work, please advise me of times that would. The County Manager has found the legal documents on issuance of the the bonds Chairman Slaughter listed in his letter of 18 January. Received yesterday (as a *.docx file, and still to the wrong email address, but this time including both residence and postal addresses), County Manager Joe Pritchard followed up on his email of 29 January, in which he had seemed puzzled about the term "financial instruments" (it's a standard term in business and investing) such as I asked for 28 January. I thank Mr. Pritchard once again for responding. (I thanked Chairman Bill Slaughter in person the other day.) The relevant correspondance about the flyer that Mr. Pritchard previously wrote was created by the VDT is still missing. I will ask for that Monday, when I respond to Mr. Pritchard's most courteous offer to inspect the financial instruments. Thanks to County Manager Joe Pritchard for responding to my letter of Monday. He partly (but not completely) answered my question by saying the VDT did it. More on that later. He included a PDF copy of Bill Slaughter's letter of January 18th. Perhaps Mr. Pritchard was unaware that letter didn't reach me until after my letter of Monday, because the county sent it to the wrong address. Mr. Pritchard's email response was also sent to the wrong address, although fortunately email to that business address does reach me. He also copied the Chairman at his business address instead of at his Lowndes County address. In any case, electronic copy is almost always more useful than paper, so I thank Mr. Pritchard for sending that PDF copy. Many thanks to Lowndes County Chairman Bill Slaughter for taking the time to respond to a citizen's question in Citizens Wishing to Be Heard! The response didn't actually answer my question, but that may be because the question wasn't clear enough without a copy of the flyer that claimed the county's new judicial and administrative complex was "100% Paid by SPLOST" and "$0 Balance Owed"; see next post. An hour or two after I sent a letter to County Manager Joe Pritchard Monday, someone from the county called to say Chairman Bill Slaughter had sent me a letter in response to my question to the Commission about bonds, but it had been returned by the Post Office. 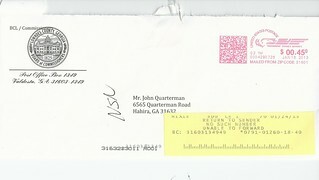 As you can see by the image of the envelope, they sent it to my residence address, where I don't get mail. That's why I always include my postal address on Citizens Wishing to Be Heard forms, open records requests, etc. Anyway, they made it available for pickup at the county palace. Ten days after the PO sent it back to them is better than never. One citizen actually got a response out of a Commissioner in Citizens Wishing to Be Heard! Unfortunately, only half a dozen citizens where there to hear that, or to see the Lowndes County Commission vote on matters that affect everyone, from abandoning a road leading to a river to an alcohol license. Here's the agenda, with links to the videos and a few notes. See also the Work Session the morning of that same day. WORK SESSION, TUESDAY, JANUARY 22, 2013, 8:30 a.m. REGULAR SESSION, TUESDAY, JANUARY 22, 2013, 5:30 p.m.
A citizen actually got an answer from a Lowndes County Commissioner at the Regular Session of 22 January 2013. Oh, and the set the clock correctly to five minutes. This morning, you had a really great report about the jail ankle monitoring system. And I would really like to encourage the county to do marketing. To call a press conference, to get some graduates from that program, to get the sheriff, to get the gentleman that spoke this morning, to stand out on the courthouse steps and talk about how great it was. People would have a really great feeling if they knew. This morning I was the only citizen here; now we've got three more. People aren't finding out.. So if they didn't come to this chamber, they wouldn't know. So I encourage you, really, do a press release, do a press conference about that. It's a gigantic huge important thing. Thank you. The Chairman started to move on, but Commissioner Evans asked if she could answer the citizen's question.